A 4WD adventure in Australia�s red centre is something every Australian and visitor to this great southern land should experience in a lifetime. The areas surrounding Alice Springs encompass everything our great land is all about and offer sights that have the potential to literally take your breath away. Your 7 day discovery of the Alice will take you through the amazing MacDonnell Ranges, which are home to some truly spectacular gorges and natural rock pools. You will then venture a little further south until you come across Kings Canyon, which is located within the remarkable Watarrka National Park. Finally, the pi�ce de r�sistance of your adventure: Uluru. Easily Australia�s most recognizable natural icon this stunning rock will leave you inspired and ready to conquer anything. The beauty of the Olga�s is also sure to blow you away, with plenty of photo opportunities waiting for you. The trip back to the Alice will demonstrate the vastness of the country and reward you when you reach the township with a warm welcoming and many fond memories of your outback Australia adventure. Begin your journey right in the middle of Australia in Alice Springs; Australia�s most central city. Affectionately known as �The Alice�, this outback town is one of the countries most famous and is regarded as the heart of Australia. Immerse yourself in the culture and heritage of this famous town as you visit the many arts centres and historical sites of significance. Discover the Indigenous people�s ties to this land and uncover exactly why this town is so special. Just minutes from the heart of Alice Springs, you will find a lovely little caravan park that offers stunning views of the surrounding MacDonnell Ranges. The caravan park boasts a fantastic new swimming pool, BBQ and picnic areas and a close proximity to all the city�s facilities and attractions. The Alice Springs Reptile Centre boasts the largest reptile display in Central Australia. Home to goannas, frill-necked lizards, thorny devils and other fascinating lizards, this centre is a must for those wishing to gain a greater understanding of Australia�s reptile life. While here be sure to visit the Cave Room, which boasts some unique fossils and a live gecko exhibit. Sure to please both those young and young at heart. Although it is located 90 kilometres west of the Alice, this swimming hole is one you will not want to miss. High red cliffs, a large crystal clear waterhole and sandy creek fringed gums characterize this amazing area and will leave you spell bound. BBQ and toilet facilities are available, making this the perfect spot for a swim and picnic. The West MacDonnell Ranges are among Australia�s most magnificent and beautiful mountain ranges. Comprised of a unique collection of gorges, these ranges are important habitats for the Northern Territory�s unique flora and fauna, and they are also rather easy on the eye too. The National Park is accessible all year round, with the winter months offering the best temperatures here. Ormiston Gorge would have to be the highlight of the park, and offers a great camping ground in which you can truly appreciate the beauty and serenity of this area. Camp in the Ormiston Gorge Campground will place you right within the heart of the West MacDonnell Ranges. Enjoy the surroundings of the gorge and the rest of the ranges as you set up camp for the night, then marvel as the sun goes down and the cliff faces emit a warming glow. Remember to keep all food and clothing secure as dingoes can be a problem. The Ochre Pits are a colourful outcrop of ochre on the banks of a sandy creek and encompass the Aboriginal history of this area remarkably well. Discover how ochre paint is made and be sure to bring the camera along to take some very pretty pictures. Easily one of the most visited attractions along Larapinta Drive, Simpsons Gap is just this: a gap in the ranges. It is one of the most attractive gaps in the range so be sure to embark on the walking track to experience the true wonder of it. The Watarrka National Park is home to some pretty amazing sights, but none perhaps more so than Kings Canyon. The journey here will take you back through the Alice, down the Lasseter Highway and onto the Stuart Highway, but once you arrive at this remarkable natural wonder, these 470 kilometres will seem like a breeze. Kings Canyon stands 270 metres high and truly is a sight to behold. If you are here during the summer months, the walk around it should only be attempted in the morning as the temperatures are simply too hot otherwise. The walk around the rim will take you to the stunning Garden of Eden and the Lost City, while the views from the top will open your eyes to the stunning outback landscapes that surround you. If seclusion, peace and serenity are what you are after, the Kings Canyon Wilderness Lodge will be the perfect place for you to stay. Set amongst beautiful oak trees this lodge offers large campsites, outdoor BBQ areas and modern camp kitchen facilities. Offering the perfect oasis from which to explore the canyon, the Kings Canyon Resort will offer a touch of class to your 4WD adventure. Positioned just 7 kilometres outside of the National Park, this resort is the canyon�s most popular so if it�s peace you are after, stick to the wilderness lodge. The Giles Trek spans for a massive 22 kilometres, so although it may not be attainable in one day, a small section of it is definitely a must. 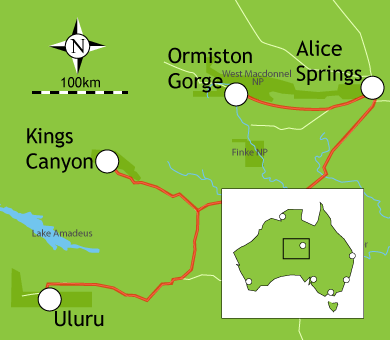 The track follows the southern rim of the George Gile Range, from Kings Canyon to Kathleen Springs and covers some superb National Park landscapes. Uluru is the sacred land of the Pitjantjatjara and Yankunytjatjara Aboriginal people and is also one of Australia�s most recognised landmarks. Positioned right in the geographical centre of Australia, Uluru (or Ayers Rock as it is more commonly referred to) attracts tourists from far and wide and is a current World Heritage Listed site. The large sandstone rock stands 348 metres high and measures 9.4 kilometres in circumference. Although climbing it is restricted, the walk around it is well worth it and will open your eyes to the majesty of this remarkable treasure. The sunrise and sunset over the rock is perhaps what draws in the tourists the most so be sure to stick around at these times. The Ayers Rock Campground will provide a sight for sore eyes with its lush green grass under the shade of native desert oaks. The campground is positioned within the Voyagers Ayers Rock Resort complex so therefore gives you access to the wide range of facilities on offer here. Situated just 30 kilometres down the road from Uluru, the Olga�s are a must while in the area. Comprised of 36 rounded domes, the tallest stands at 546 metres and is aptly named Mt Olga. There are two walks you can take around the domes. One is the Valley of the Winds Walk, which is 7 kilometres and the Olga Gorge Walk, which is a comfortable 2 kilometre walk that will take you into the heart of the gorge. Your adventure will finally draw to a close on the fifth day, when you have to leave beautiful Uluru behind and drive the 452 kilometres back to Alice Springs. While there isn�t much to see along the way, you should definitely take some time to check out the East MacDonnell Ranges, which are just outside of Alice. Attractions within the ranges include The Emily and Jessie Gaps Nature Park and the Corroboree Rock, with both well worth a look. Alice Springs may mark the physical end of your journey, but this trip is sure to stay in your heart forever.